Can you read? Then read this. These were the words of a pastor as he handed a Lutheran magazine to Patrick Zengo, an employee of Mwadui Lutheran School in Tanzania. He found Patrick sleeping near the ovens at the school for warmth when the day was done and the sun went down. Patrick had been hired as a janitor and yard worker at the secondary school. After reading the literature given to him by the pastor, he came back and asked for baptism. The headmaster of the school then noticed that as Patrick labored outside, he stood near the open windows of the school and listened to the instructions. He inquired and found that Patrick had completed primary school but had no money for secondary education. He told him to come inside and sit in the classroom, giving him the benefit of secondary education even though he was unable to pay the tuition. 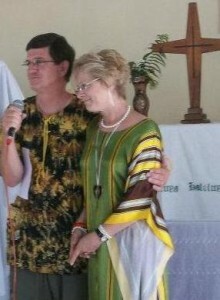 Patrick eventually married and had one daughter named Angel and was assisting the church as an evangelist in 2010 when the mission group from the Mid South District of the Lutheran Church Missouri Synod in the United States arrived. He accompanied Cindy and Mike Jurgensen of Memphis, TN on their evangelism visits into the village and acted as their translator. They were impressed with his ambition and heart for the ministry and sponsored him to attend a two year pastoral training program at the seminary in Arusha. 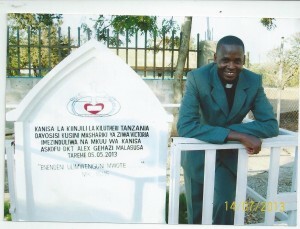 He completed it in 2013 and became first pastor to be ordained by the newly ordained Bishop Emmanuel Makala . Patrick now pastors 7 churches and 20 sub parishes in the South East of Lake Victoria District in Tanzania. He and his wife Lois recently welcomed their second daughter, Happiness into the family joining big sister, Angel. A warm reunion was possible in May of 2014 when Cindy and Mike Jurgensen returned for another mission trip. With the growth of the Church in this area, the need for trained pastors and deacons is critical to disciple the growing number of Christians in the area. If you are interested in a mission trip or supporting the training of pastors to meet this critical need, please contact Bob Allen, Director of World Missions, Mid South District at rjallen@prodigy.net.